Express Your Creativity With Endless Possibilities Of Classy, Elegant Decor. Unique Stunning Decorations : Candeberg Brings You 6 Flameless Led Candles In An Elegant Box. Candle Size: 4 X3.8 Cm. Paper Wrap Size: 6 X 6Cm. Great For Gifting This Festive Season. They Make A Stunning Decor Statement Both Indoors And Outdoors, Especially When Used With Candeberg’s Exclusive Thick Paper Designer Decorative Wraps (6 Pcs Included With Your Purchase). Reusable & Cost Effective : A Wick Flame Wax Candle Lasts Approximately 3 Hours. Candeberg Led Candles Last 70 Hours+ Each With A Single Cr2032 Lithium Ion Battery Equivalent To Repeated Use 3 Hours Daily For A Whole Month And More! Reuse Each Candle By Replacing Its Battery – Easily Available With All Electronics And Mobile Vendors Or Online From Amazon.In. 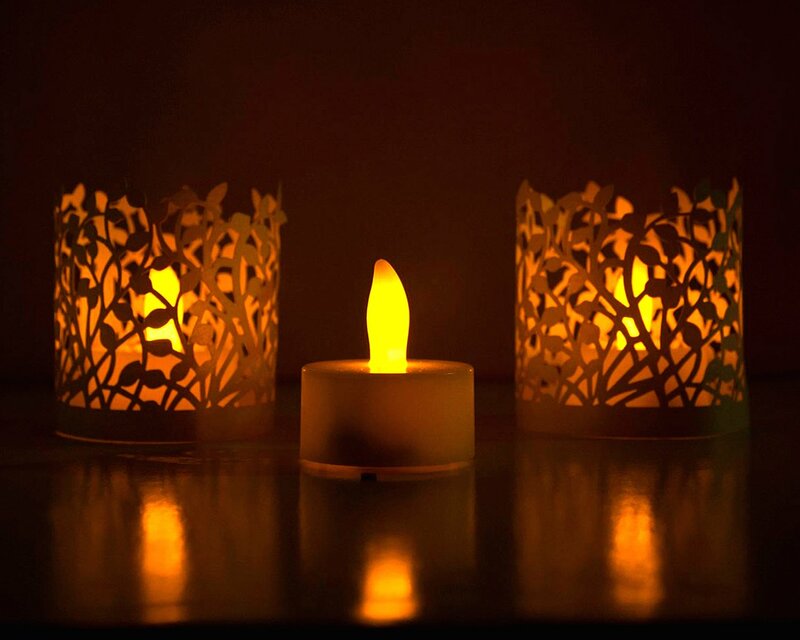 Safe : Candeberg’s Tealight Candles Are Heat And Smoke Free. Safe To Use With Children And Pets Around. Multi Purpose Candle: Plus, You Can Let Your Creativity Go Wild. Our Led Candles Are An Elegant Choice For Your Lawns, Weddings, Gardens, Romantic Dinners, Parties, Yoga Class, Poojas, And Especially For Diwali, Dussera, Christmas, Navrathri, Eid And Other Festivals.